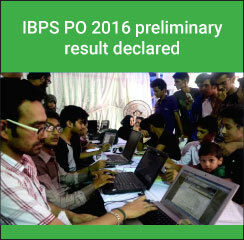 The Institute of Banking Personnel Selection (IBPS) has declared IBPS PO 2016 preliminary result on November 4. The result of IBPS PO 2016 includes sectional as well as overall marks secured by candidates in the online test held on October 16, 22 and 23. IBPS PO 2016 result has been declared only for those candidates who have secured a sectional as well as overall aggregate qualifying mark as per their caste categories. All qualified candidates are eligible to appear in IBPS PO 2016 mains exam to be held on November 20, 2016. Candidates can check IBPS PO 2016 result either using their registration and roll number or through their password and date of birth. The stepwise procedure to check IBPS PO/MT 2016 result is given below. According to IBPS PO 2016 mains exam pattern, the test will be of 140 minutes and online question booklet will have 200 multiple choice questions from Reasoning, Quantitative Aptitude, General Awareness, English Language and Computer.